Right now, it's hip to hate DC. Ever since Identity Crisis, a very loud and insistent contingent of fanboys has stopped judging DC's books by their content, preferring to just dismiss everything the company puts out. They somehow got personally offended by Identity Crisis and have been holding a grudge ever since. Unfortunately, that means they've missed some really good stuff, like the new Blue Beetle. As a high school student in El Paso, Jaime Reyes is impatient to grow up. When he finds the mysterious Blue Scarab, he is imbued with powers and technology he struggles to control. 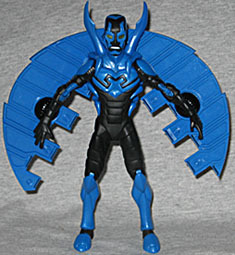 The Blue Beetle is a character with a long and surprising history. 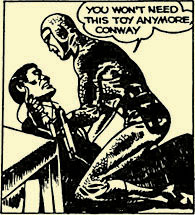 The original was nothing more than a rip-off of several other pulp and comic heroes, and didn't get any kind of promotion from his publisher. Despite that, he proved unimaginably popular with the fans, and the Beetle was launched to superstardom, with his own radio drama and a newspaper comicstrip - drawn by an unknown youngster named Jack Kirby (working under the company pen-name of "Charles Nicolas"). The character was revamped (twice) during the mid-60s, and has successfully survived two transfers of ownership. Considering his less-than-notable origins, the fact that anyone even remembers the name "Blue Beetle" today is a huge victory in itself, not to mention that DC has gone to the trouble of revamping the character yet again. The new Beetle is a marked departure from his predecessors. Though Jaime inherited the second Beetle's mystical scarab, he got an entirely different set of powers from it. And, in fact, learned that it isn't mystical. Go figure. While the last guy to get any benefit from the scarab could fly and had enhanced strength, Jaime gets a full-on suit of technological battle armor. Way to trade up, Beetle! Cully Hamner is the guy responsible for the new Beetle design, and he did an excellent job on it. There are some subtle nods to the previous BB's costume, but this is obviously its own unique creation. The suit definitely has the whole "insect" thing going on, with a hard, segmented look to the whole thing. The elbows and knees have the suggestion of flex panels on the interiors. His fingertips are flat and bulky, suggesting suckers. Beetle has a few accessories that are actually bits of his costume. It's been shown, in the comics, that the suit adapts itself to situations as needed, so it will sometimes "sprout" new accoutrements. For instance, a big pair of wings. The wings' technological design matches the rest of the suit, and they plug onto the figure's arms. In a really cool move, they can be locked together to form a giant shield, just like in the comic. Of course, after that happened in the book, the wings also swiveled around and attached to his shoulders, but the figure doesn't match that. Jaime acquired the talisman that gives him his powers after the Spectre, rampaging through the DC Universe, destroyed the Rock of Eternity - the source of Captain Marvel's powers. Shards of the Rock were scattered around the world, and Jaime found the Blue Scarab half-buried in an abandonned lot. When Booster Gold came looking for his friend's property, he found that it had crawled off a night stand and embedded itself on the kid's spine. Now, when he's in danger, it crawls out from under his skin and forms the armor. To portray that, the figure's backpack is removable. The sculpt captures that technological feel really well. The plates overlap nicely, and the edges of the pattern are sculpted in. The paint apps are mostly good, giving the blue parts of the costume a metallic sheen, which stands out well from the matte black. Cutouts on his legs and backpack reveal silvery panels. There is one app missing, however, and it's a bit disturbing: his eyes are clear. BB's mask has a sort of "Mexican wrestler" feel to it (in keeping with his placement in the Southwest), and the eyes are supposed to be yellow. However, it seems the figure's head is molded from translucent plastic, and his eyes were left unpainted. There's a bit of a tint, but not enough. Time for a custom. The reason the head is translucent under the paint? Beetle has a variant. In Infinite Crisis, the new Blue Beetle is instrumental in defeating the Brother Eye satellite - it was cloaked so well that not even Superman could find it, and Beetle negated its vibrational frequency to pull it back to reality. Unfortunately, the scarab then freaked out because of all the Green Lanterns around, and shifted Jaime's vibrational frequency to escape from them - which was represented by him turning transparent blue, in much the same way that "invisible" characters have long been portrayed in comics. 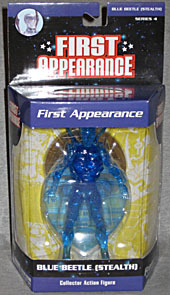 The variant is molded entirely from translucent blue plastic. What's really impressive about this figure is the articulation. Sure, at a glance, it does't seem any better than the average DCD figure - no, there's no waist - but there are a lot of surprises. Beetle moves at the knees, hips, wrists, forearms, elbows, biceps, shoulders and neck. The wrist and forearm swivels may seem redundant, but they serve a real purpose: when the wings are plugged in place, you can move the hands without repositioning them. On top of all that, the wings have a swivel joint where they plug onto the figure, which is why you can get them together in shield mode. The Scarab backpack doesn't actually plug onto the figure at all; it just clings to him with its tiny legs. All six legs and the big pincers that give Beetle his distinctive silhouette are balljointed, so you can pose them as well. Kinda makes up for the waist. It's hard to believe the fanboys thought this Beetle was too dark, or that he was going to be grim and gritty. Of course, they also thought he was Ted Kord brought back to life somehow, which just proves that fanboys are idiots. Or maybe that it's stupid make snap judgments. 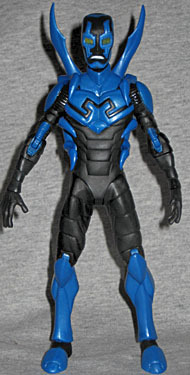 The new Blue Beetle is a really fun character, with a cool supporting cast and an excellent design. The comic is one of the best new titles DC's come up with in years, and the figure is one of the best DC Direct has ever made. Both definitely fall in the "must buy" category, so get to the comicshop, double-time!